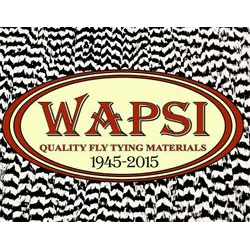 Wapsi is one of the World's largest wholesale distributor of fly tying materials. Based in Arkansas USA - Troutcatchers get a good regular supply from Waspi UK & USA Distributors. 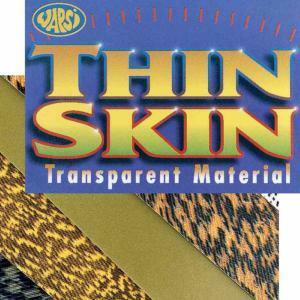 Waspi thin skin is a thin, transparent and stretchable material. The skin is shiny on one side, and matt on the other, easy to cut to your desired fly tying shape. The skin is ideal for nymphs, wing cases shrimp backs etc. 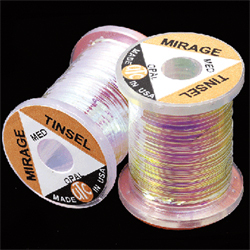 UTC Mirage Tinsel - Flat semi-translucent pearl tinsel. 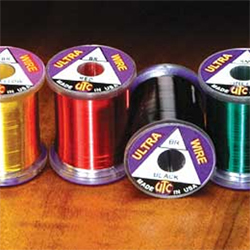 UTC Ultra Wire (Extra Bright Colours) - UTC Ultra Wire is the best fly tying wire for many fly-tiers, the colours, rich and vibrant. 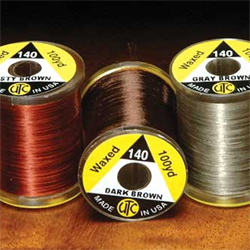 UTC Ultra Wire Brassie: 0,22 mm - 4 Colour choice. 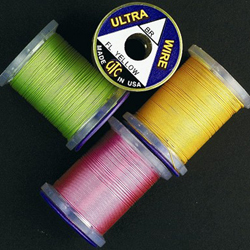 UTC Ultra Wire Brassie: 0,22 mm - 8 Colour choice. UTC Ultra Thread 140 Denier, an excellent thread for the majority of flies, it is the perfect choice for size 2 - 16 flies. Due to the threads vibrant sheen and excellent colour retention, it is a good substitute for floss on small flies. An extra strong silky smooth thread (lightly waxed) that lies flat, the flatter the thread is wrapped, the more slowly it builds up, a good general purpose thread. UTC Ultra Thread 140 Denier 100 yard spools, (approx. 6/0), choice of colours. UTC Ultra Thread 70 Denier, a great size thread for tying the smallest of flies and for tying with low bulk on larger flies. It is the ideal choice for dry flies, nymphs, and midges size 14 or smaller. 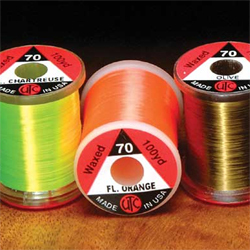 An extra strong silky smooth thread (lightly waxed) that lays flat, the flatter the thread is wrapped, the more slowly it builds up, a huge advantage when tying small flies or when tying close to the eye of the hook, also a flat thread grips and covers materials with fewer thread wraps. UTC Ultra Thread 70 Denier 100 yard spools, (approx. 8/0), choice of colours. 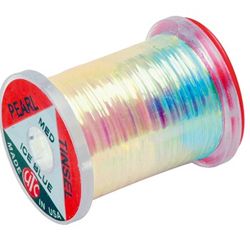 UTC GSP Thread - 100 denier Gel Spun Polyethylene thread is incredibly strong for its size. The GSP thread has all around versatility for fresh and saltwater flies, especially for bonefish and permit fly patterns and a favourite for trout and smallmouth bass streamers. 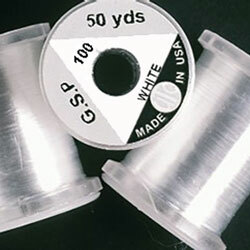 UTC GSP Thread 50 yard spools, available in Black (very Dark Grey) or White. UTC Ice Blue Pearl Film, a flashback pearl tinsel with a Blue UV iridescence.